Proud and honored to be a part of this awesome event happening on August 11, 2018 for a worthy cause in Temecula, hosted by Gabriela Perez-Hudson. “Viva La Vida!” is the Master Class of the Year! Join us for 2-hours of dancing to Celebrate Life and to facilitate the process of connecting with the joy of living through music and dancing. 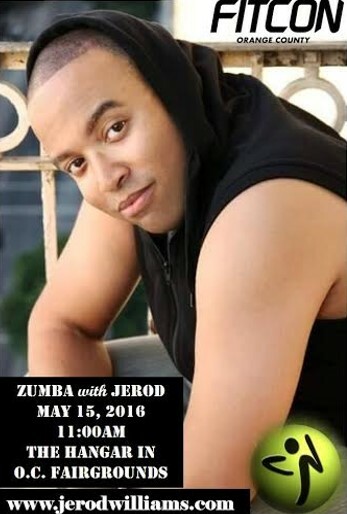 Featuring Southern California’s Most Amazing Instructors in ZUMBA® Fitness , U-JAM Fitness® and DIO®. We’ll be donating 80% of the net profit (does not include vendors sales) to support MICHELLE’S PLACE a local non-profit organization dedicated to empowering individuals and families impacted by breast and ovarian cancer through education and support services. You can get your tickets at this link right HERE. 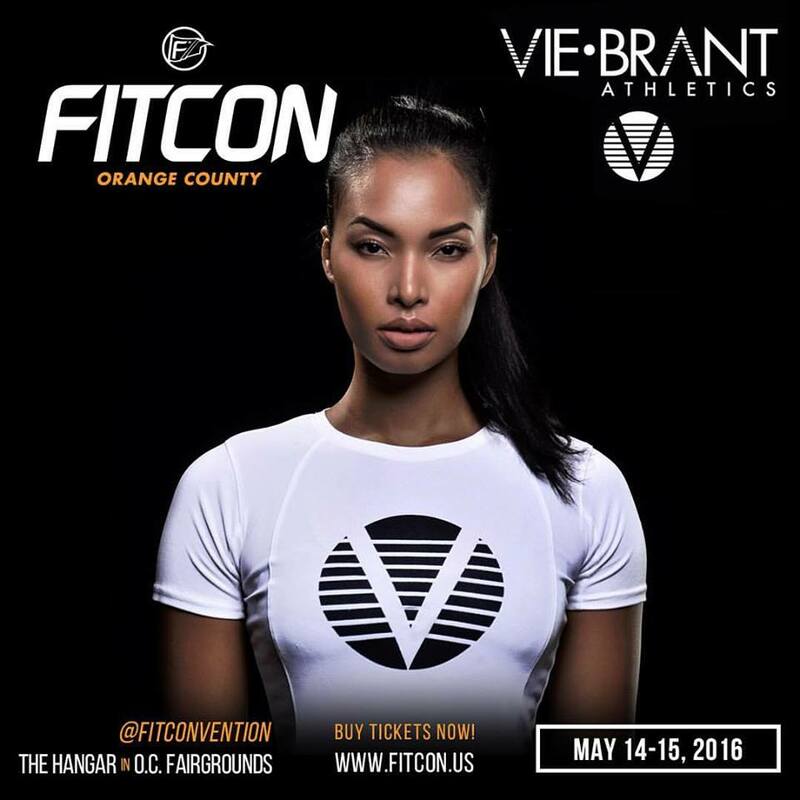 Also, I will be at the VIEBRANT ATHLETICS booth with my sister-in-fitness, Ms. Nelita Villezon and her workout clothing line. Come out, see me, do some fun demos and have a party. Saturdays at 12:00PM for U-Jam Fitness®. It’s a PARTY disguised as a FITNESS! 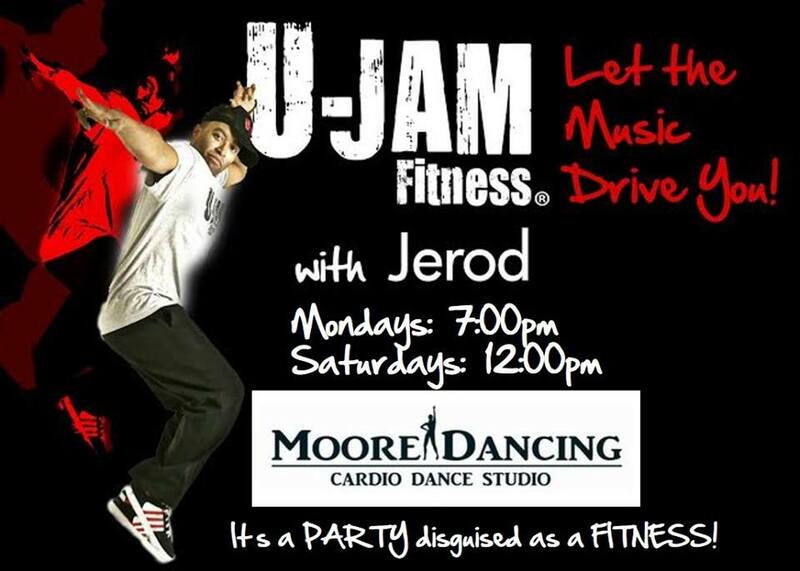 Come Join Jerod on the dance floor for #Motivational Mondays at Moore Dancing. The beats drop at 7:00PM as well as Saturdays at 12:00PM. The address is 11943 Montana Avenue, Brentwood, CA! 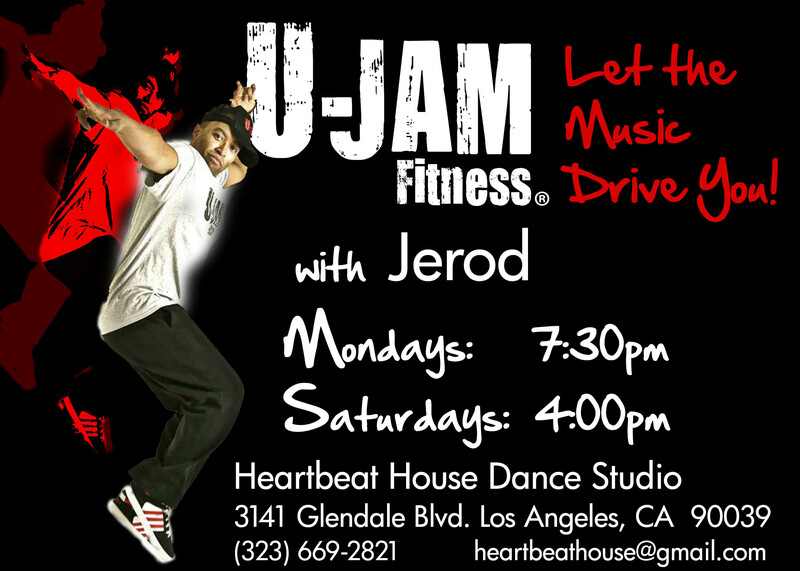 Come let the music drive you and JAM WITH JEROD! $5.00 for your first class if you’re new to the studio. Saturdays at 4:00PM for U-Jam Fitness®. 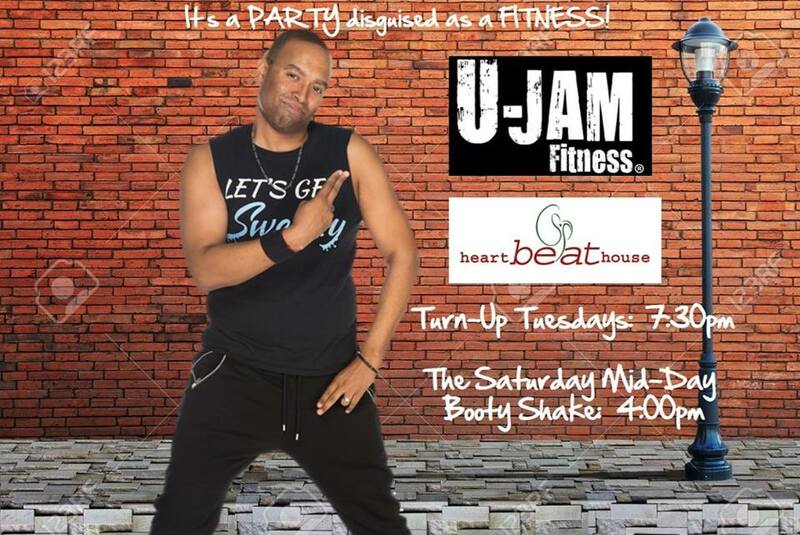 U-Jam Fitness® with Jerod Williams Turn Up Tuesdays at 7:30PM Saturday Mid-Day Booty Shake at 4:00PM at Heartbeat House Dance Studio. $5.00 for your first class and class packages are available after your first week of classes at a discounted rate. SAVE THE DATE!!! West Hollywood just got a little more FABULOUS! Join me for the launch of U-Jam Fitness at 24 Hour Fitness – West Hollywood Super Sport and YES, FOLKS! This will be an permanent class starting October 17th at 7:30PM. The address is 8621 Santa Monica Blvd., West Hollywood, CA. Members are FREE; non-members, download a GUEST PASS and for the preview class, all is welcome! Join me as we set the Group X room FLOOR ON FIRE! 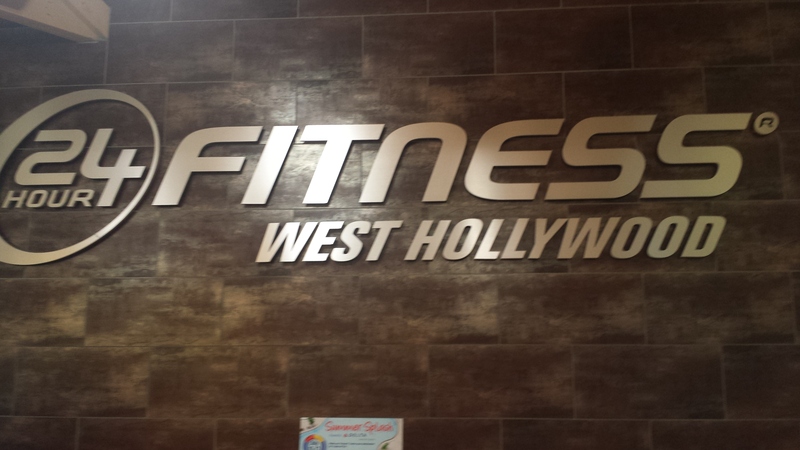 Join Jerod as he previews U-Jam Fitness at 24 Hour Fitness in West Hollywood on Friday, October 17th at 7:30PM. 24 Hour Fitness is doing a FALL REMIX! Where we challenge you to refresh your routine and try something new! In lieu of the FALL REMIX, I will be previewing a demo U-Jam Fitness class at 24 Hour Fitness, Anaheim Garden Walk on Thursday, September 25th at 7:30PM. The address is 321 W. Katella Avenue, Suite 94, Anaheim, CA! Bring a friend for FREE! Come join me as I spread the LOVE and UNITY out in Orange County! Lace up your kicks and LET THE MUSIC DRIVE YOU! NEW CLASS ANNOUNCEMENT: In addition to the SATURDAY at 4:00PM class at Heartbeat House Dance Studio, I’m also there on MONDAYS now at 7:30PM. That’s TWO chances to get your U-Jam Fitness on. Come experience an athletic dance workout like no other! You won’t be disappointed. First time students at the studio, your class is $5.00 and if you buy a class package within your first week, it’s 10% off the class package. See you on the dance floor! I am pleased to announce that I am now an Official U-Jam Fitness Instructor. This was definitely one journey that required a lot of WORK, BLOOD, SWEAT and TEARS. I will be starting up classes once I tackle (or should I say MURDER) this choreography. So excited about learning and growing my fitness repertoire. U-Jam Fitness is an athletic dance fitness format. The “fitness” is built into the workout with easy-to-follow choreography that repeats and has levels of intensity (1-Basic and 2-Advanced) and the participant/student chooses their level. U-Jam has urban moves with world beats so every class is a party. Visit U-Jam Fitness’ website by clicking HERE to learn more about how to become an instructor (payment plans are available), finding a class near you or to get this fitness hosted in your facility. See you on the dance floor! 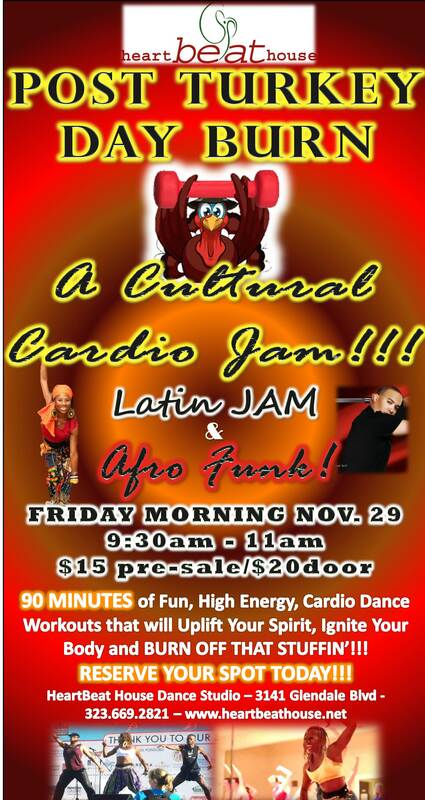 JOIN MYSELF and the AFRO-FUNK GODDESS herself, Tanita, (on November 29th from 9:30AM-11:00AM) for an awesome CULTURAL CARDIO JAM that is guaranteed to sweat away those POST-TURKEY pounds that you will put on while giving THANKS this holiday. We’ll be bringing you Latin Jam Workout and Afro-Funk Fitness together in one room for what promises to be an AMAZING 90-Minute Workout! We’ll also have LIVE DRUMMING for part of the workshop. Space is limited so definitely reserve your space early by calling (323) 669-2821. Your body will THANK YOU! $15 in Advance and $20 at the Door! You can also message me here on this site and I will send over the link as well for purchasing your tickets early. Join myself and Tanita for our CULTURAL CARDIO JAM (Latin Jam and Afro Funk). 90 Minutes of uplifting cardio guaranteed to melt off the Thanksgiving pounds! Saturday, December 14th (6:00PM-8:00PM), join myself along with Mychele Sims (U-JAM FITNESS), Cuba Swift (SALSA HIP-HOP) and Wendy Reateagui (ZUMBA) for what promises to be an epic TWO-HOUR Master Class featuring different workout genres and all for a good cause: THE HOLIDAY BLANKET, HOT CHOCOLATE AND DONUT DRIVE FOR THE HOMELESS. All proceeds and blankets for this event will go to helping out the homeless in Downtown L.A. In addition to blankets, all proceeds will go to providing hot chocolate and donuts. The event will be held at Gail Medina’s studio BACK TO BASICS FITNESS DANCE STUDIO in Glendale, CA. The address is 2836 N. Verdugo Road, Glendale, CA 91208. The Master Class is $20.00 in advance and $25.00 at the door. If you include a blanket with the Master Class, you will save $5.00 off the entrance. All blankets must be clean and/or new prior to presenting them to the studio. It’s a worthwhile cause as there are so many homeless people and providing them this gift would definitely make their holiday season. See you on the dance floor! 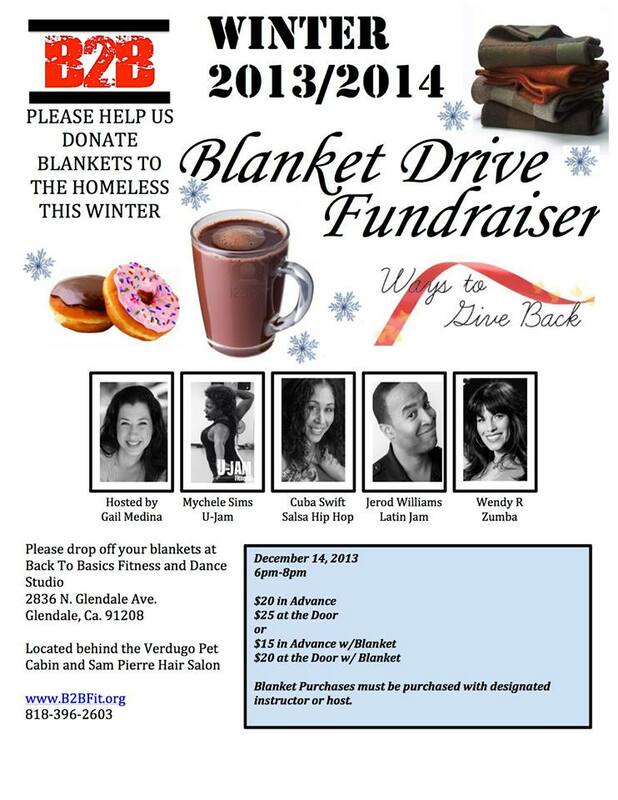 Join myself, Mychele Sims, Cuba Swift, Wendy Reateagui and our host, Gail Medina for our Blanket, Hot Chocolate and Donut Drive, Saturday (December 14th from 6:00PM-8:00PM). 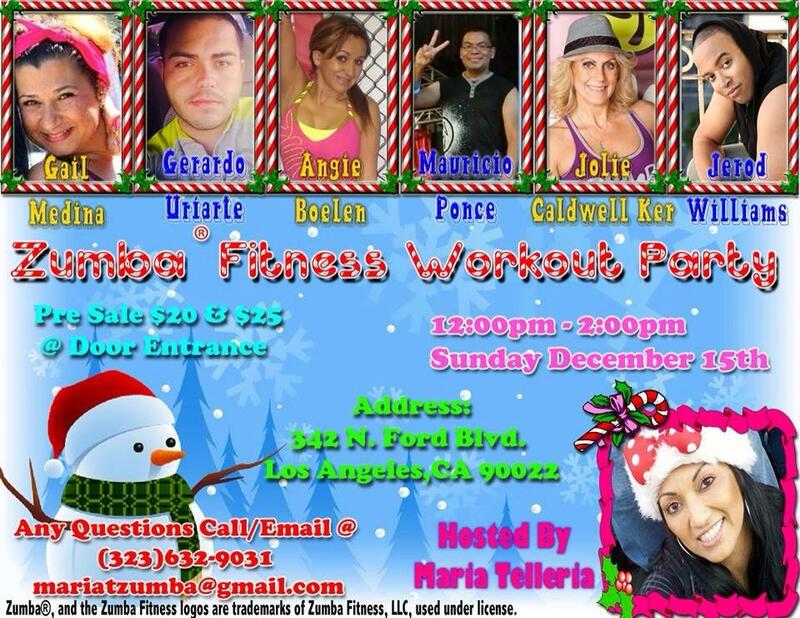 I am going to be ONE of the SIX instructors for the upcoming ALL STAR ZUMBATHON event happening at The Los Angeles Dance Center on Sunday, December 15th (12:00PM – 2:00PM). Tickets are on SALE right now and you can buy them through me on my website. Tickets are $20 in advance and $25 at the door. Just click on the PayPal tab below. Be sure to get your ticket early to secure your spot so that you can get your pre-Christmas workout on with us before you get our grub on this holiday season. Wear festive Xmas colors and let’s have a grand ol’ time. 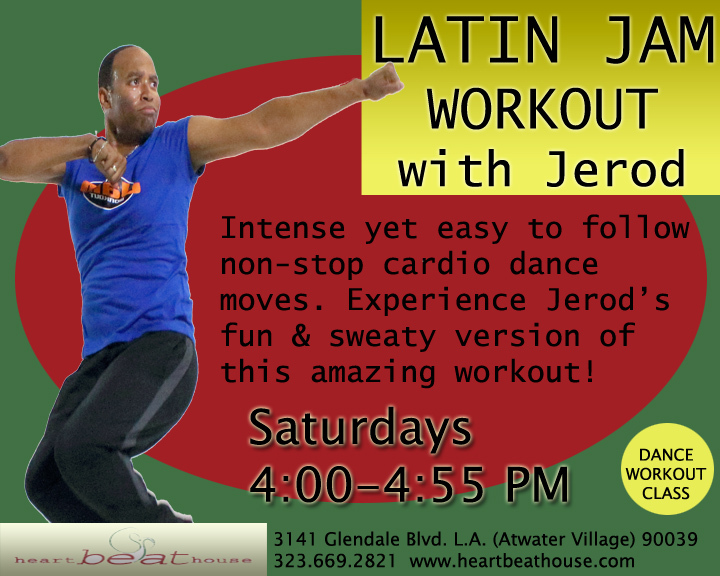 I walked into the doors of Heartbeat House Dance Studio almost four years ago wanting to improve my health and start being active and fell in love with the Latin Jam Workout class. So much so that I became an instructor. Fast forward to 2012, I’m now teaching every Saturday at (4:00PM) at the place where it all started. Amazing how things can come full circle – the journey is far from over. For more information about Heartbeat House Dance Studio, please visit their website by clicking HERE. See you on the dance floor! 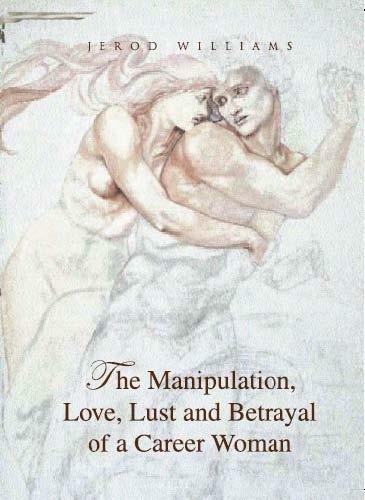 I am pleased to announce that my play THE MANIPULATION, LOVE, LUST AND BETRAYAL OF A CAREER WOMAN can now be bought in digital format on AMAZON.COM. For those of you who have KINDLE, iPOD, iPAD, ANDROID, BLACKBERRY or even a personal computer can download a copy of my play for $9.99. Click HERE to go to AMAZON’S site to download your own personal copy and get started reading something I put my heart and soul into writing. I do hope you enjoy it. I am pleased to announce that I am now a LEVEL 1 (TYRO) LATIN JAM WORKOUT INSTRUCTOR. My journey is not over yet. I’m loving this exercise that is dubbed to be “ZUMBA on OVERLOAD”. LATIN JAM WORKOUT combines Latin music and dance with traditional aerobic cardio. It’s a fun exercise that promotes a healthy lifestyle all the while having fun. If you are in the Southern California area, look us up and take a class. I promise you, you won’t regret it. Visit the website by clicking here. You can also find me freelance writing for LA Splash Magazine Online. Click on the logo to read my articles. “….a rewarding read designed to take the ongoing debate between the sexes to the next level. The Manipulation, Love, Lust, and Betrayal of a Career Woman, a play of four scenes with epilogue, explores the kinds of challenges a person might encounter in the search for love and fulfillment in today’s confusing, fast-paced, lonely hearts world. Available online at the following links: Amazon.com, Borders.com and Barnes and Noble.com.